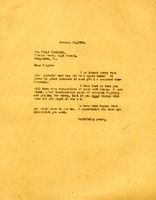 Letter to Floyd Cantrell from Martha Berry telling him that she is sorry that his work is under appreciated and she includes a testimonial. She tells him that she feels in time he will have some recognition and that after twenty seven years of her fighting for Berry she has realized that if you stick with things that things will come out alright in the end. She informs him that she wishes he would come to the schools for a visit.